Soft cotton faced fabric. Drop shoulder style. 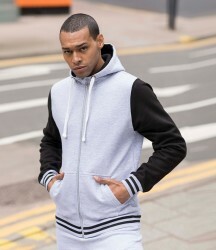 Three panel hood with contrast single jersey fabric inner. Chunky flat lace cream drawcord. Full length metal YKK zip with chin guard. Contrast sleeves. Front pouch pockets. Ribbed cuffs and hem with stripe detail. Tear out label. WRAP Certified Production.